Would you like to see us carry more plants and fish? Each piece of Cholla wood is unique, yours may not look like the pictured item. We reccomend boiling this wood for at least 5 mintues prior to placing it into your tank. It may take 48 hours before your cholla wood is water logged enough to sink. You can speed this process by placing somthing heavy to weight it down in your tank. We use Cholla wood in all of our shrimp tanks as we find it to be of great beenfit to the shrimp. 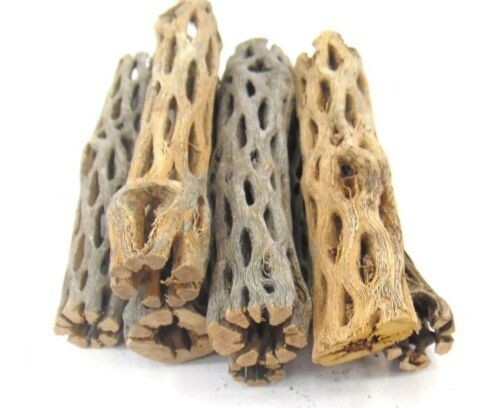 Cholla wood is ideal for use in shrimp tanks. It creates a media for biofilm to grow which is beneficial to shrimp and shrimp breeding. Cholla are the remains or skeleton after a Cholla plant dies. Cholla is a soft wood and will release tannins into your water much like that of Indian Almond Leaves. With the general "holey" appearance of Cholla wood it provides your shrimp with great places to hid in times of stress, much like that of the time after they molt. Cholla wood will break down in your aquarium but this is at a very slow place. An average lifespan for Cholla varies on size, but should last in your tank for 7-14 months. And everything else shrimp related! © 2019 TheShrimpFarm.com - A Division of Five Star Sellers Enterprises. All Rights Reserved. Have ideas on how we can improve our website or order process for our customers? Please contact us.